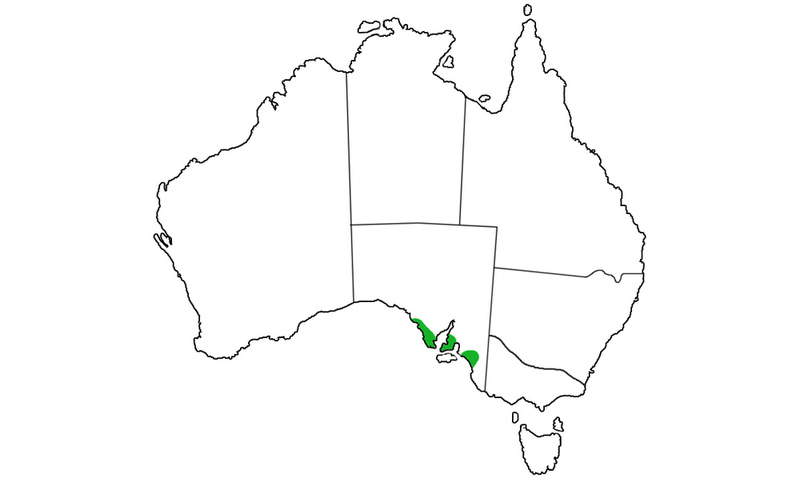 The Peninsular Tiger Snake is found on Eyre Peninsula and on the islands of South Australia, such as Kangaroo Island.
. The venom of the Peninsula Tiger Snake is actually more toxic than the venom of the Common Tiger Snake. It is also five times more toxic than that of the Indian Cobra. The diet of the Peninsular Tiger Snake is varied, depending on where it comes from. Some Islands contain many species of birds, whilst other Islands might only have lizards to offer the Tiger Snakes as a source of food. Often when subduing a rodent or bird, the Peninsular Tiger Snake will throw a loop of its body around the prey and constrict it while the venom takes effect. This is similar to the way pythons constrict their prey. The Peninsular Tiger Snake grows to a little over 1 metre. As with other Tiger Snakes they produce live young, with up to 20 in a litter. The venom of the peninsula tiger snake is actually more toxic than the venom of the Common Tiger Snake. It is also five times more toxic than that of the Indian Cobra. The peninsular tiger snake produce live young, with up to 20 in a litter.